Simply put, I am a girl who loves gadgets. Especially if they’re as cute as a button, and serves many functions. Functions which may or may not be important. Recently, during a baking session at Senor Pablo’s abode, located in the Land of Cake and Muffins, I was introduced to this wonderful cow print contraption called the Mukka Express! It’s so cute grr and as you’ve probably noticed by now, I have a soft spot for cow prints and zebra prints. 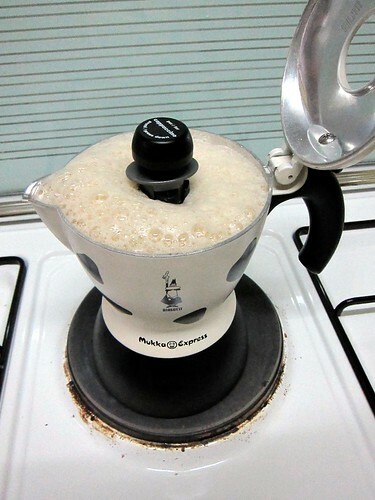 Anyway, it is a cafe latte maker and produces yummy yummy coffee! See the frothy bubbly creaminess! 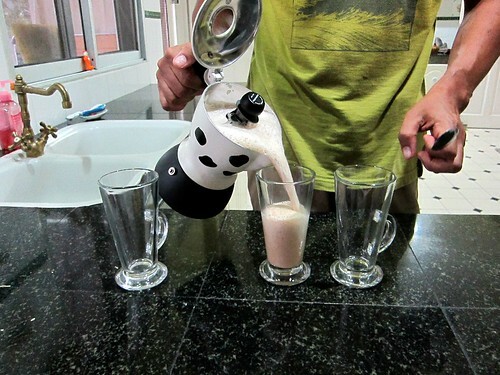 Of course, before u get the wrong idea, it doesn’t just produce cafe latte out of thin air. But all u need is coffee and milk! I want one. Where can I get one? Pablo bought it in Singapore. We can buy on Amazon! 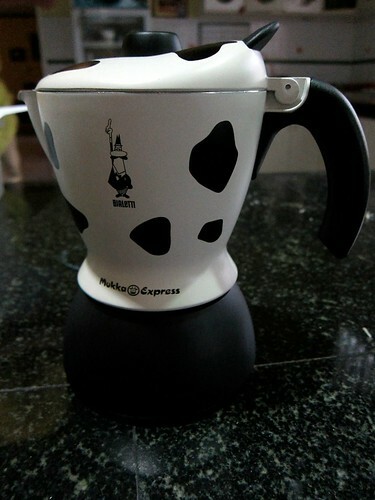 Bah if u buy, u have to make me a cuppa ah! Thanks for the post.. What about the cheese and onion muffins? LOL!! Jade.. you can get it from Tangs in Singapore at $170.